Less than two minutes into President Donald Trump’s speech in Grand Rapids, Michigan, he lied about special counsel Robert Mueller’s final report. It is not true, however, that the special counsel exonerated Trump of obstruction of justice. While we still can’t say for sure what the special counsel said — all we know of Mueller’s final report came by way of a brief summary of it sent to Congress on Sunday by Barr, Trump’s hand-picked attorney general — even Barr’s letter acknowledged Mueller did not exonerate Trump of obstruction. “While this report does not conclude that the President committed a crime, it also does not exonerate him,” says Mueller’s report, according to one of the few direct quotations from the special counsel’s report included in Barr’s summary. Barr, together with Deputy Attorney General Rod Rosenstein, made the subsequent decision to clear Trump of possible obstruction of justice charges. The public still hasn’t seen the final report, which the New York Times reported on Thursday is over 300 pages long. It remains unclear if the special counsel intended for Barr and Rosenstein to resolve the obstruction question, or if he primarily meant to use his report to present evidence to Congress. It’s also not not quite the case that Mueller said “no collusion,” as Trump claimed. According to another quotation from the report included in Barr’s summary, Mueller concluded that “[T]he investigation did not establish that members of the Trump Campaign conspired or coordinated with the Russian government in its election interference activities.” But not establishing a conspiracy is not the same as finding no evidence of collusion at all. After falsely claiming total exoneration, Trump used Barr’s letter to go on the attack against some of his most prominent Democratic critics — including the chair of the House Intelligence Committee, Adam Schiff, who went viral earlier in the day when he responded to a Republican effort to compel him to resign during a hearing by reciting the major pieces of evidence suggesting the Trump campaign did in fact collude with Russia. While Trump and his allies have spent the week crowing over the fact that the special counsel apparently won’t be indicting Trump or any additional associates of his, it remains unclear when members of Congress or the public will be able to see more of the Mueller report beyond the less than 100 words quoted in Barr’s summary. Following a phone call with Barr on Wednesday, House Judiciary Committee chair Rep. Jerry Nadler (NY) said the attorney general made it clear that he won’t meet an April 2 deadline Democrats set for making the report public. “We’re not happy about that, to put it mildly,” Nadler said, according to the Times. 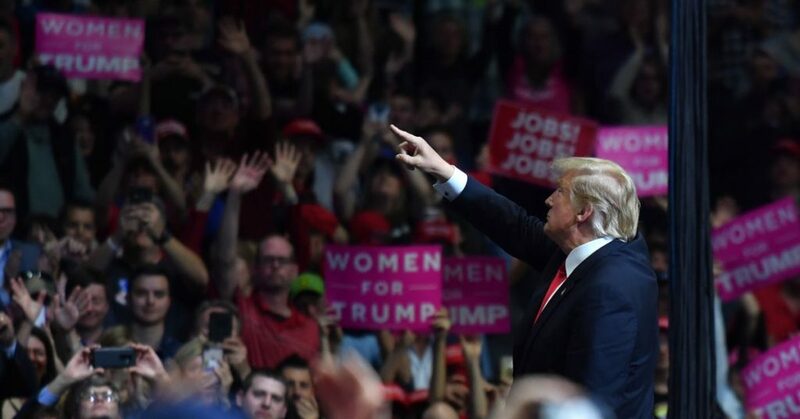 During his speech in Michigan, Trump did not bother trying to explain the apparent disconnect between his misleading declarations of total exoneration on one hand, and his administration’s apparent reluctance to release the Mueller report on the other. After all, if the report is as exonerating as Trump has indicated, then why not make it public and take yet another victory lap?